kissing pharrell and leaving her lipstick behind saying 'Now you gotttaaa go to make-up' hehehe tiptoeing away. I love her, she is so cute. janvinron wrote: Madam will leave soon? I think all the coaches should rotate to keep each season interesting. He's a good coach though - he knows what to say. 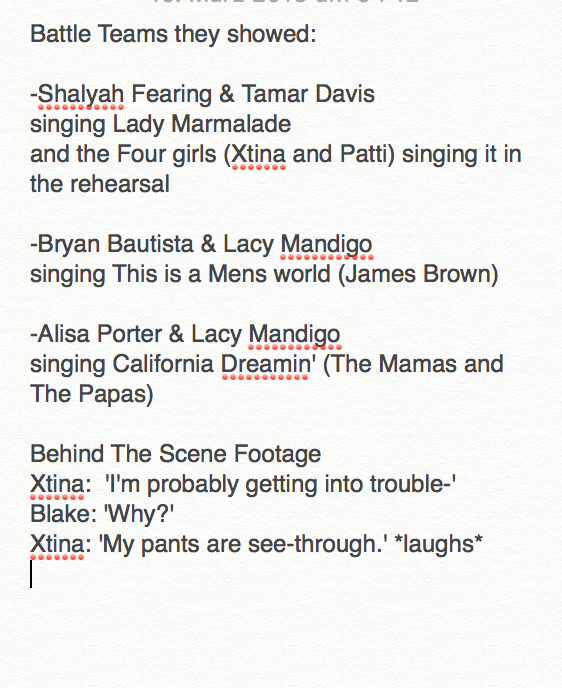 WHY DIDN'T THEY SHOW XTINA SINGING TOO? We can only dream, he had to leave like 5 seasons ago. I hope she wins the show so she could leave it already. I want to see Patty. If the stolen ones make it further than the ones on her team one more time, I WILL FUME. Christina looks so hot in that blue dress. Her and Patti are life. Alisan will win the voice!!!!!! So Monday's episode will be divided into 2. The rest of the blinds the first hour and the start of the battles during the second. I know for sure that the poster got the some of the songs wrong. Tamar and Shalyah is singing LM and Byran and Malik is singing "It's A Man's World" according to the preview that aired tonight. Last edited by UnicornBlood on March 9th, 2016, 10:38 pm, edited 1 time in total. The battle rounds repeat a name twice. That's cute. Is there a clip? Do they show Christina and her team last? Ozzy wrote: Do they show Christina and her team last? my friend called so i'd watched the first 90 mins for nothing lol. missed Xtina's segment. Does Christina get Ryan Quiin?